Frag Pro Shooter is a mobile game on Android phones, produced by Oh Bibi. It has also been made available for phones with the iOS operating system and PC with an emulator. This game is said to be a combination of two interesting game patterns: Multiplayer Online Battle Arena (MOBA) and Overwatch which is also a producer of shooting video games. One of those games is Hero Shooter. Frag Pro Shooter combines the gameplay of Hero-shooter and the MOBA’s pattern which involves 3-lane gameplay. In this game, players get a win when they score the highest points by achieving all the objectives. The ability for them to come back as any hero when defeated was gotten from the Overwatch’s gameplay. There is a wide variety of fancy characters in the game. These characters will have their roles to play in Attacks, Defense, Center, Wild, and Camp. The Camps are responsible for keeping each team lanes protected from the enemies. Attackers are the ones who go directly after the enemies. The people in Defense protect the attackers and those pushing. Those in Wild support everyone in the various groups. The 40 characters in the game are mostly original designs but they also have MOBA tropes included. Some of them include Symmetra, Reinhart, the hero in a hazmat suit, the one who looks like a witch doctor, and even Reaper knock offs. Any of these characters can be respawned when one of them is defeated in battle. In the game, you are able to build your teams to fit the style in which you choose to defeat your enemies and you have the option to make upgrades to your players so they have better characteristics. No matter what characters you’ve placed in your team, not wandering too far is one of the requirements to going far in the game. If you leave your teammates, there’s no way you can work together to completely deplete your opponent’s life bar. To be able to take your opponent down, you’ll need to take down their heroes to gain access to their spots. Shooting their bull’s eye targets is the only way for you to take their control areas. During the game, you are able to pick several gold and silver coins. Knowing what to do with them and doing the right things are very important. The gold coins are mainly used for player upgrades and to purchase more heroes. Your diamond coins should go into getting Season XP boosters and more chests. You can also use the diamond coins to open the chest. As you pass and unlock several levels, you would also unlock new heroes. Knowing what to do with them is essential. Build three battle decks and organize your heroes based on their characteristics. A proper grouping of your heroes would strengthen your team, making you more likely to defeat your opponent. Besides playing the game normally, there are daily missions expected to complete. If you’re able to finish them daily, you’ll gain more diamonds you can use for your purchases. After completing the daily challenges, you should collect the daily gifts which could be anything from chests to hero cards. Killing heroes in your opponents’ armies give you red medals. These medals are used to collect chests, just like diamonds. The small map on the top shows you where your opponents are. Looking at it occasionally also shows you how far you are from them, which lets you take defensive measures if necessary. You should never go where there is a concentrated group of enemies. Staying on the spot while shooting at your enemies is not a good thing. Your hero can easily get shot, so always be on the move while shooting your enemies. Upgrading all your heroes gives you an edge over your enemies’ teams. You only have access to one character at a time which means you have to make sure the others are good enough to protect you and themselves from the enemies. 1. Community: There are several communities in the game composed of the millions of players from around the world. 2. No teams: Frag allows you to play alone to control your multiple characters, not playing with friends you’ve met in one of the communities. 3. Building a team: You’re able to build teams of attackers, defenders, wild characters, etc from your 40 characters. Your characters also possess special abilities which can be used at times. 4. No hiding place: With all players exposed, no one can hide in corners or shy away from the battle. Every player is out in the open until the battle is completed. 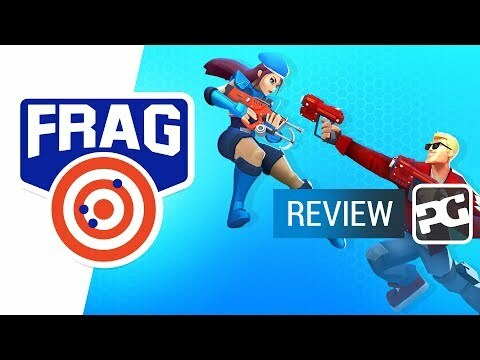 Frag Pro Shooter is one hell of a mobile game which everyone would enjoy. With its ability to change into any of your heroes when you die, to build several battle teams, and to fight against several teams who are also conscious of your will to kill them and claim their space, you’re up for a big epic match. The game also allows for real-time duels which involve you assembling all your heroes and challenging your opponent after choosing a location for your duel. You then fight against a hero in the opponent team in a 1v1 battle. There are several missions which let you unlock several coins and items. They also help you get your players advanced and ready to keep the team alive. The game allows you to shoot whenever you aim at your enemy, so it doesn’t require tapping a gun by the side. The game is filled with great action and requires skill and concentration to reach the finish line. With Frag Pro Shooter coming to iOS devices, millions of people worldwide will be involved in this exciting and challenging game. It is very possible to get this game on your personal computer. Getting an Android emulator such as Blue Stacks and Nox Player on your system is the way you can do this. It allows you to install and play mobile games and use other mobile applications on your laptop. After installing your emulator, the steps to get your game working are easy and quick. On your Google Play store, you’ll find the FRAG PRO SHOOTER which can then be installed and launched.